Following is an excerpt from Cynthia’s upcoming book on the element formulas. The ancient knowledge known as the theory of the five elements has been preserved in astrology, alchemy, and oriental medicine. 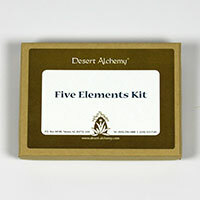 In its most simple form, this theory says that all living things are made of five elements. In astrology and alchemy they are called fire, water, air, earth and ether. In oriental medicine, they are referred to as fire, water, metal, earth and wood. But whatever their names, these elements are not to be interpreted literally but as symbols that represent five different groups of qualities or characteristics. Once we understand these five groups, they become a system which can be applied to gain new insights about people, their behaviors, and their health and well-being. Every person has all of the elements to a greater or lesser degree. For instance, someone with an abundance of the air element is probably more intellectually oriented in life. Those with a predominance of water filter their experiences more through their emotional nature. People who have a predominance of the earth element are more physically oriented. Fire element people see the world through their innate understanding of spirit and passion. The following Desert Alchemy formulas are combinations of flower essences meant to harmonize the excess or deficiency of the elements within ourselves. These formulas have been carefully researched and formulated to help harmonize the qualities of the elements commonly used in astrology, alchemy, and eastern five-element healing systems. There is one composite flower essence formula that relates to each element: air (metal); fire; earth; water; and wood (ether). Created in 1986, they have been used since that time by practitioners and self-help users alike. You can use an element formula to balance either the abundance or deficiency of a given element. For instance, if you have too much fire element, you can use the Fire Element Formula to balance it. Likewise, if you are lacking in the fire element, you can use the same formula to strengthen it. Or, you can use other element formulas to create balance between the elements. For example: someone who has an abundance of air might want to strengthen the earth and water elements if they are weak by using the Earth Element Formula and the Water Element Formula together. Once you learn about each, you can creatively choose how you want to balance the elements. The recommended general guideline is to use four drops of the formula, four times a day, or as often as you feel you need it. To increase the effects, use them more often rather than increasing the number of drops. It’s fine to use a formula with other flower essences at the same time. To help you select the appropriate element formula(s), click on the name of each formula below to see an extended list of the characteristics that the formula helps harmonize. This formula helps balance an excess or deficiency of the characteristics associated with the earth element: physical; material; form; structure; the ability to manifest an idea; practical sense; building; determined; holding on; grounded; anchored; stable; cautious; careful; conservative; steady; consistent; slow but sure; stubborn; obstinate; rigid; obsessed. This formula helps balance an excess or deficiency of the characteristics associated with the fire element: energy; action; transformation; enthusiasm; passion; will; motivation; conviction; the strength to survive; faith; open to direction from your higher power; knowing the source; spirit; burned out; intense; don’t know when to stop. This formula helps balance an excess or deficiency of the characteristics associated with the water element: emotional; receptive; feelings; compassion; the unconscious or subconscious; intuitive; cleansing; dissolving; no shape of your own; communication through feelings; holding onto emotions; taking on feelings or emotions of others; strong ties with the past. This formula helps balance an excess or deficiency of the characteristics associated with the wood (ether) element: the quintessence; the pure and subtle essence of a substance; new beginnings; the energy state before physical manifestation; organic; organization; the ability to rise above chaos; the ability and desire to focus on the inner life.